Parenting children is hard. There's no two ways about that. It's not easy emotionally, mentally or physically. Children are a great blessing and a treasure from the Lord, let there be no mistaking that. However, they come with a lot of work attached. One of the reasons that it is so hard to parent is that each child you have is your responsibility. You are responsible before God to how well you parent your kid and beware to anyone who leads a little child astray. (Matthew 18:6) If God takes the business of raising children seriously, then shouldn't we also? It's not a situation you should enter into lightly, just because you think you are physically able to create a cute child or you are desperately in want of someone to love you. 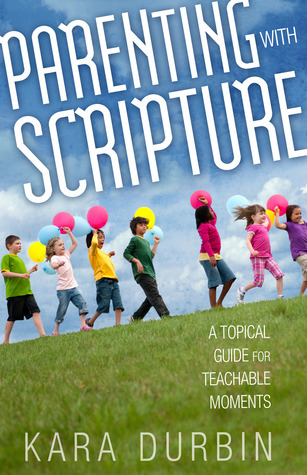 Parenting with Scripture : A Topical Guide for Teachable Moments, by Kara Durbin, provides easy help for parents who are serious about raising a child in the fear and respect of the Lord. In this book Durbin takes a list of topics that you would typically run into as a parent of a young child or teen (or another adult, or yourself) and provides several applicable scriptures to help you address problem areas. For example, when it comes to dealing with anger, she defines what it is, provides the full text for several passages in scripture which deal with the topic, gives a list of additional scriptures which you are encouraged to look up, and writes out a short devotional for you to use with your child in getting a grip on their anger issues. She gives the same type and kind of information for any variety of issues from apathy, gossip, hate, guilt, laziness, patience, perfection and stress. If that list looks negative to you, the book doesn't focus entirely on such harsh topics. It also gives scriptures which encourage the child with hope and healing. How should a child handle criticism? Competition? Knowledge? You'll find that this book assists you in getting at applicable verses in a hurry or verses to linger over and memorize. 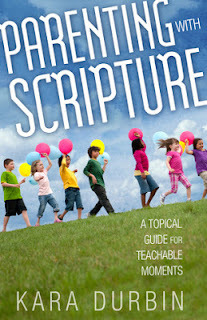 It rather goes without saying but Parenting with Scripture isn't designed to be used apart from the Word of God. Although this guide is very handy you'll need to be careful not to use it in such a way that you yourself fall into the lazy habit of not reading the scriptures directly (in context, in deep study) for yourself. I know Durbin doesn't mean for that to happen as much as I wouldn't mean to take things that far. Saying this is a warning for me personally (as well as anyone else who decides to pick this book up!) but it is also a huge compliment to Durbin who took the effort to search the scriptures and put together an easy guide for parents who are struggling with their children to overcome sin. Kara Durbin wrote this book to be a tool to minister to parents who are striving hard to train their children well and I think she succeeds in her goal. This is a marvelous tool and resource and one I find myself happy and enthusiastic in recommending to other parents. I am happy to kick-start my recommendation of this book by letting you know that Moody Pulishers authorized me to give away one copy of this book to one of you. To enter? Simply leave a comment below. This contest will be open through Monday, March 4th. Thank you, Moody Publishers, for sending a copy of this book my direction and for providing two extra giveaway copies as well. Sounds like an excellent resource. Thanks for the review! This sounds really good. I wonder if it's somewhat similar to "For Instruction in Righteousness" put out by Doorposts? This sounds so helpful as i start my parenting journey! Sounds great! I love books that pair with the Bible! I want all my responses to be Biblical! this is a great resource. Sounds like a great book for grandparents, as well as for parents. Would love to read (and own) this book. Just not too many verses about slaughtering your enemies, OK? This sounds like a good book. I'm mustering my resources! I would definitely like to read this. I would love to read this book. I need some direction in this area. Would help if I left my email address,too! Thanks! I would love a Biblically-based "guide" for some of the tough stuff we've been facing. 11 year olds are complex! Just discovered your blog. Please throw my name in the hat! Thank you for the giveaway, Carrie! Woo-hoo!